Last December, I posted my stitching goals for this year (http://blog.fiberholic.net/2007/12/stitchy-goals-for-2008.html). It's time to call myself to account and see how I did. Not done, but I did make progress on it throughout the year. Still not done, but will be in my rotation as I complete things in January. Well, I did end up doing twelve, but they were bunched up at the end of the year and were mostly temari. I'm going to try to get better this coming year. 6. Complete the Take It Further Challenge. This means incorporating whatever the challenge is into a piece every month. I managed to complete the January one and then got snowed under with other things. English Sampler was completeded - Swiss Sampler was not started. Significant progress, but not finished. Made progress on Tuscany but not the Victorian Garden. Done as of a couple of days ago. Did not make, BUT ... I received Luck of the Irish with its kit in the mail a couple of days ago. It will go into my rotation also in March. Done! It's the project for CyberPointers' January program. Obviously, I could have done better. On the other hand, I could have done worse. Overall, I completed 48 pieces this year, including some big ones. I'll write my goals for next year tomorrow. They'll probably be overly ambitious too, but what's the worth of a goal if you don't try to stretch yourself? The pieces of this I've been doing lately are big, so it looks like I've made a lot of progress. I added a second pipe and three triangles. The next bits are going to look like less done because they're all small Jessicas. It's DONE! I finished Midi Mystery 2 yesterday. My husband already has the frame and just needs to order some mats and do the lacing and such. The one thing I'd change on this is the background fabric, given a choice. I like the lavender plants in the corners and I looove the Desert Shadows color of Waterlilies. This is my largest Chatelaine finish to date, even though I've been working for a longer time on Medieval Town Mandala. This week I added what look to me like doors to the buildings to either side of the central one. I feel like this is going more quickly now than part five did. Maybe I'll be able to accelerate it some. As of Friday, I was soooo close to finishing this. Everything but the beading is done and it was calling to me, so when it came up next in my rotation (yesterday), I just did a marathon beading session on it. I'll show you the results tomorrow. This week, the Lady's flag got one more stripe of red at the bottom and brown on the opposite edge of her skirt. It feels good to see her actually progressing again, and she'll be given a higher priority in my rotation as soon as the Totales Mysterie is done - hopefully by the end of the week. Yet another holiday finish to show you- I finished my work on Jeanne's block for the On the Seamy Side round robin. This is my last block to work on, and I had a bit of a problem - all that was left to work on seam-wise was a teeny two inch seam. I did it, though. I also did a flower in the stitch of the month - Cretan stitch. Then i added a ribbon around her tree because the center looked a little naked compared to the rest. The ribbon's actually the tie from Rose Anne's Christmas cracker that she sent me. I hope Jeanne likes the block. i think it looks really pretty. The cats' grandparents sent me a present for Christmas! It's a lovely group of fibers from Stitching Bits and Bobs. Aren't they pretty? So many varieties too. I'll have to think on how to put them to best use. Thank you! I pulled this back out and into my rotation again, too! As you can see, it's very close to being done. I added the satin stitches in the middle of the medallion and all the smyrna crosses around it. I also fixed the triangular stitches that had pulled out in the major band above it. All that's left to do on this is finish the outer border, four stars around the medallion, smyrnas around the medallion, and the two bottom corners of this bottom band. I hope to get it done by February. Bibendum's back in my rotation. I finished enough things in the past week that I was able to add him back in. Since I have some projects with deadlines coming up - commitments for my needlepoint guild and for the EGA chapter - I've changed my way of adding things back in. Right now, it's alternating between something I've previously started (like Bibendum) and something new. I'm happy he made it back. When I stitch on him, he just takes on personality. As you know, I fell behind on this while I was out in October and early November. I've been slowly closing the gap, and in this picture I'm on part seventeen of twenty. In the past week since this picture was taken, I've completed parts seventeen and eighteen and am working on part nineteen. It'll be done early in the new year. Here it is - the 25th and final finish of my challenge! I decided to just get it done last time I dragged it out, even though there was quite a bit more to go. I -think- it's going to be framed. Anyway, there were a lot of little specialty stitches in it and, once those were done, it went rather quickly. This is the last of the four balls I made for my husband's colleagues last week. It was interesting making the star pattern. It counted as one of my project challenge finishes and I hope the recipient liked it. I opened my exchange Christmas crackers with all the other presents last night. They were fun and full of goodies! This top one is from Rose Ann. 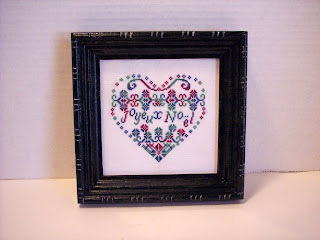 She pieced the pretty crazy quilt block and added three motifs to it. Then she stuffed lots of fabrics with unusual textures, some lace, and some threads in it. Oh, and lace and beads, too. Thanks, Rose Ann! Lyn sent me a pretty medieval block with a lady in the middle. My daughter's already claimed it; it's getting made into a pillow for her once I'm done embellishing it. She spent about twenty minutes last night deciding what charms and stuff were going to go on it. Thanks, Lyn! And I got this bunch of treats from Kerry - lots of glitzy fabrics and goodies inside, especially beads. I also got something called a mesh button maker. I've never heard of one, so I'm going to get to learn something new. Thank you! I hope everyone who got what I sent likes their goodies, too. My seamy side round robin block came home to me late last week. Doesn't it look neat with all the additions on it? The ladies who worked on it did such a good job! Thank you Kerry, Jeanne, Bonnie, Clairee, and Candi! Now I need to figure out what to make from it. Yay! I've finally finished all the cross stitches on this! Now all that's left is the specialty stitching for the last part and then all the beads for the whole piece. I feel like I can get it done before the end of the year and let it get framed. It'll be the largest Chatelaine piece I've finished yet, and the second one I ever started. The first one I started is the Medieval Town Mandala. It's only taken me two and a half years to get this done. I made the heart as a gift for one of my husband's colleagues. He finished framing it day before yesterday, and I thought you'd like to see what it looks like. I think it came out pretty well. Yet another crazy quilting finish! This is Donna's block with everything I did on it. as you can see, I added two more motifs and another seam. I used Sheep's Silk from Thread Gatherer for the center of this flower and Treenway silk ribbon for the petals. I think it came out pretty well. The initial is in Needle Necessities floss. I had the color lying on my desk and I thought it'd go well. That corner needed something. I hope Donna likes what I did. This also makes finish 24 of my 25 project challenge. One more to go. All I did this week was some more brown. At least it's getting worked on again. This is the third of the four temari I made for gifts. It was probably the most complex of them, although almost all the stitching was in one thread. I like the way it came out. Of course, it counted as a project finish, too. I have only two more to go to finish my challenge! Well, I've started work on another round robin block. This is my next-to-last one for the circle, though I just found out my block is still only on the second person - four months and it's only been worked on by one person. Can you tell I'm disappointed? I doubt I'll ever get it back. Aaaanyway, this is Donna's block. Her favorite thing is just extreme embellishment. The block's supposedly been through three people already and looks kind of bare to me. This is what I've added so far - a cascade of swirls and a half wheel buttonhole seam. Today I'll be adding an echinacea in wool and silk. I'll probably add at least one more seam before I send it on. I finished off the Algerian eyes in the fleurs de lis and started the Jessicas. There are several at the bottom of each corner piece. Once I'm done with them, Part 2 will be officially stitched and Part 3 only has its specialty stitches. Yay, you can see the four leaf corner now! I'm getting caught up on when I fell behind, and I corrected the right side error completely now. I finally finished the top row here. Those six stars were hard to do and took a lot of time for each because they got so thick it was hard to see the threads underneath the stitching. Anyway, the rest should go more quickly now (I hope!). There's really not that much more to do. A second gift temari here; the pattern on this one's called dogwood and I'd not done it before either. They're not that hard to do once you start, but I can tell I still need to cultivate patience in marking the balls to get them more even. This one also counts as a project finish. This week's progress is really visible because it's a big woven diamond in the middle of the piece. The directions were a little weird, but I managed to follow thme and make it. It looks all glitzy in person. The colors on this temari remind me of a candy cane. It was the first time I did this design, and I think it came out all right. The visible marking thread is actually glittery - white Hi-lights. I don't usually like this color combination, but my husband preferred red to the other color I offered him as an option. Oh, and it counts toward my project challenge! Another building outline started this week. It's interesting to work through this and see it take shape with all the overdyed flosses. Each building is unique because of it. As I finished an ornament, I added Lady of the Flag back into the rotation this week. Didn't get to do too much, but did get her back in and make some progress. After being away from it so long, I was startled to realize I'm about two-thirds of the way done with it. So I finished with the Rhodes and Algerian eye stitches around the corners this week and started the Algerian eyes in pink in the fleurs de lis. I'll be doing pink for a while. I have all the flowers to fill in on the garden panels. The project I'm teaching Cyberpointers in January is this piece of needlepoint. As a space and money-saving finish, I made it into a book sleeve. I think it looks kind of neat, don't you? I'm really happy this came out so well! It looks wonderful in this thread (Bush Christmas from Dinky Dyes). It even counts as a project finish for my challenge! See, I told you I'd get it one before Christmas! If you want to do it, it's at Solo Brode. I'd wondered what those odd swirls were - turns out they were the beginning of the alphabet. you can also see how the corner's shaping up on the top right. I even made progress on correcting my mistake. Hopefully I'll get caught up in another week or so. I'm up to four stars of the six at the top. They're a pain to do because of how they're made, but I've got the majority done. Made a little progress on the stars at the bottom, too. I think the problem I'm having with all the progress bit is that there are pieces like this, Poirot, and the ornament that are just taking so long - because I work on them in rotation instead of alone. Here Solo de Noel is halfway done. As I write, I'm putting the finishing stitches on it. Yay! Another ornament before Christmas! It'll be my very last and I'm pushing over to my normal rotation again now. I really like the colors I chose; the fabric and the thread give a kind of old look to it. This week, I added sparkling crosses inside the van Dyke stitches. I like how it's turning out, though I feel I'm going sooo slowly. I've been feeling that about a lot of my projects lately. Maybe I'll finish one this week. I hope so. Another one done would make me feel better. 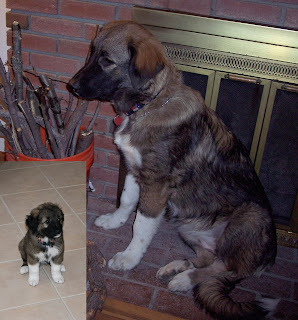 Remember that cute little puppy I brought home from Kosovo in June? I decided it was time for an update. The inset picture is from June, while she was still in Kosovo. Each of the tiles she's sitting on is about ten inches square. The larger picture is her a few weeks ago, picking sticks. She's still adorable and sweet and loving, but growing! Right now, she's close to a hundred pounds and comes up to mid-thigh when standing. Isn't she still cute, though? She's still got a lot of growing to do, as she's only seven months old. I love her! I'm still working on this. It looks like I won't finish it before the end of the year without some luck, though. I started the bottom skirt of the girl in the middle. Evidently it's really stripy and purple. Once I have the skirt done, all that's left is beading, at least.